Few composers have achieved the widespread and lasting popularity of Antonin Dvořák. He was a master of instrumentation and symphonic form, composing a total of nine symphonies. His most celebrated work, Symphony No. 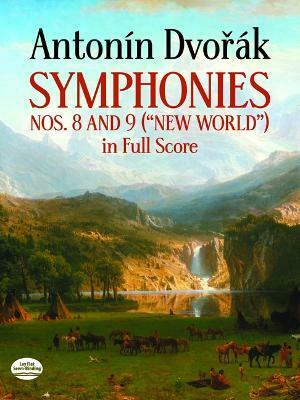 9, "From the New World" (composed during Dvořák's three-year stay in America), echoes the folk spirit of his native Czechoslovakia as well as American influences, and is filled with the spontaneous melodic invention, rhythmic variety, and intensity of harmony that characterize his orchestral works. The popular acclaim accorded the symphony "From the New World" tends to overshadow Dvořák's other symphonies, but Grove's Dictionary of Music and Musicians notes the "interesting...form...folk-spirit...virile serenity" of Symphony No. 8. The delightful freshness and uninhibited emotionalism of the composition have contributed to its lasting success. The Dover edition presents both symphonic masterpieces -- among the most popular works in the orchestral repertoire -- reprinted from authoritative editions in one inexpensive, practical volume. This full-size, easy-to-read score has been printed with generous margins to allow insertion of notes, analyses, etc. The sturdy binding, high quality of reproduction, and affordable price make this volume ideal for musicians, music students, and music lovers in general.